In November of 2012, a Mercedes pulled up to a home not far from downtown Bucharest, the capital of Romania. As the young driver got out of his car, a thin, blonde man in his early 30s emerged from the shadows and fired a dozen bullets from a Kalashnikov rifle into his chest and head. In an eerily similar scene, six months earlier in London, the same blonde man fired six bullets from a Makarov semi-automatic pistol into a Moldovan-Russian banker as he exited a London taxi near his apartment. As he left, he quietly dropped the gun. Both attacks were classic organized crime hits by a professional hired killer. Police identified him as Vitalie Proca, 33, from the Republic of Moldova. 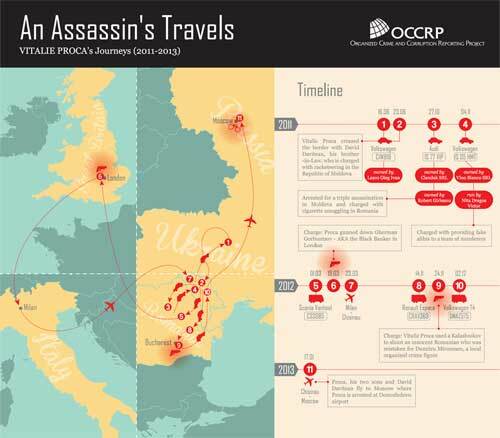 OCCRP along with the Guardian traced Proca’s life and business relationships and found him connected to an ultraviolent network of criminals. This network of hit men is paid to pull the trigger to settle conflicts between criminal gangs. Together they are known to be responsible for a number of murders and attempted murders of alleged criminal figures. Police say they are also involved in cigarette smuggling, trafficking in persons and other organized crime activities. The Romanian police say that the Bucharest attack was a case of mistaken identity. Proca mistook the innocent man for Puiu Mironescu, the alleged leader of a Romanian organized crime group. According to Romanian law enforcement, Proca was hired to kill Mironescu by a rival Romanian criminal gang whose leaders had themselves been targeted for assassination by Mironescu. The unwitting victim, who survived the attack, was caught in the middle of the gang feud because he lives in the same neighborhood and his make of car and car registration was similar to Mironescu’s. Proca was arrested in Moscow after an Interpol arrest warrant was issued by Romanian authorities in his name. Proca, however, should never have even been in London or Bucharest. A career offender, Proca should have been safely locked in prison but either excessive leniency by Moldovan officials or some help from his friends freed him. Blonde and athletic, Proca, grew up in the tiny village of Pitusca, about an hour drive from the Moldova’s capital of Chisinau. Local townspeople and his teachers remember Proca as bright, capable and good with the girls. Others remember a tendency to steal even from his mother’s own pharmacy. In 1997, however, at only 18 years of age, Proca showed the depth of the violence he was capable of. On Christmas day, he and three accomplices broke into the house of a family in a neighboring town intending to rob them. He tied the mother of a two year old child and another woman and beat them to death with a metal pipe. The third woman was also tortured and burnt with a clothing iron before passing out, according to the indictment. She survived because Proca believed her to be dead. Proca was convicted to life for the sadistic crime, but two years after the sentencing, in 2000, a Moldovan court for reasons unknown and despite the violence of the crime decided to reduce his sentence to 25 years and, in 2010, the Supreme Court of Justice in Chisinau further reduced the sentencing to 20 years. In a surprising twist, also in 2010, Judge Andrei Bălan, decided that Proca should be a free man despite the fact that the Moldovan law says prisoners can only be paroled if they have served two thirds of their sentence. Proca was still required to serve a minimum of three more years. On top of that, according to prison authorities, he was never a model inmate and continued his violent ways being involved in no less than 50 offences while in custody. However, the court decided Proca deserved leniency because he had a child who he fathered during a conjugal visit in jail and because he allegedly suffered from poor health. In September 2010, Proca walked out a free man from the Rezina penitentiary. At some point, Proca gained an ownership share in a pharmacy called “The Health in Pitusca” SRL in his native village. Judge Bălan is currently under investigation for releasing Proca. OCCRP accessed Moldovan border crossing logs that show Proca’s travels after his release from jail. These 22 detailed log entries point out to dates and places he crossed borders and the vehicles he was driving. The cars Proca was driving connect him to a network of other killers for hire and crime figures. In the morning of October 27, 2011, Proca crossed the border from Moldova into Romania through the Sculeni border point at the wheel of an Audi A6 belonging to a Romanian limited liability company, Clandak SRL. The company is owned by Robert Gîrleanu, a Moldovan-Romanian citizen who was arrested in Romania and charged with killing, burning and burying three car thieves in the Moldovan woods in 2000. 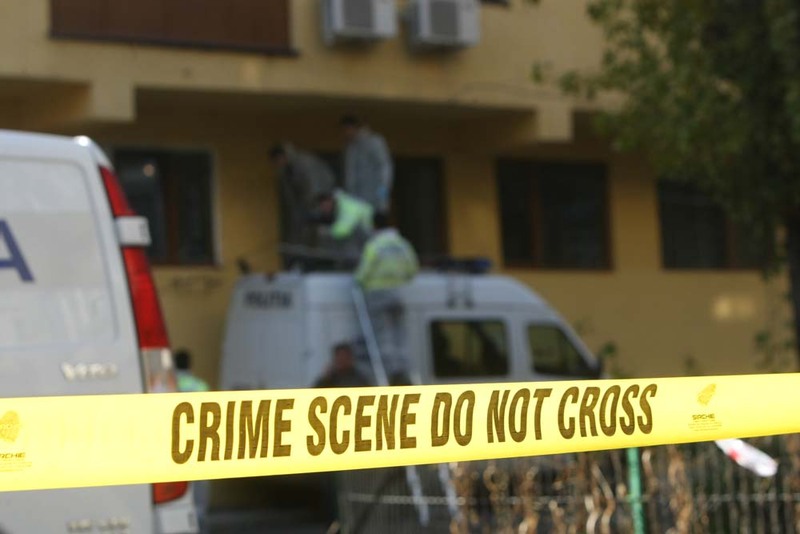 The Moldovan authorities say that Ion Anton Druță, alias “Vanea The Writer” – a Moldovan underworld figure, ordered the assassinations. Druță runs a commercial company in the same Romanian city of Iași where Clandak SRL is headquartered. Clandak SRL was established in 2005 by Iurii Cheptea, a Romanian-Moldovan citizen. In 2007, the company was handed over to Robert Gîrleanu and his wife, who is still the director of the company. Cheptea and Gîrleanu are accused by Romanian prosecutors of smuggling cigarettes between Moldova and Romania. According to Romanian law enforcement, they were working with a Romanian organized crime group – the Corduneni Clan. Gîrleanu developed real estate businesses with Iulian Dănuț Ilincariu, a prominent member of the clan, Ilincariu told OCCRP. Ilincariu together with other members of the clan was charged in 2010 with organized crime activities and fraud by Romanian prosecutors. In the past few years the relationships between Gîrleanu and Ilincariu deteriorated and the pair are now suing each other in court over joint real estate investments. Proca returned to Chișinău nine days later on the 4th of November but this time in a different car, a Volkswagen Golf registered to another Romanian commercial company, Vino Bianco SRL. The same Volkswagen Golf was driven across the Romanian-Moldovan border in 2010 by Druță-aka “Vanea the Writer”. The private limited company that registered the car is administered by Victor Dragoș Niță, a Romanian citizen accused of aiding the alleged killers of Valer Damian, a controversial businessman from Bacău, Romania who was tortured and murdered in August 2011. Damian was previously imprisoned for tax evasion and money laundering. During the investigation of the murder, Niță provided police with fake alibis for Grigore and Tudor Druță, the brothers of Ion Anton Druță, who were eventually arrested for the murder. According to Romanian prosecutors, Niță and the Druță brothers are relatives. 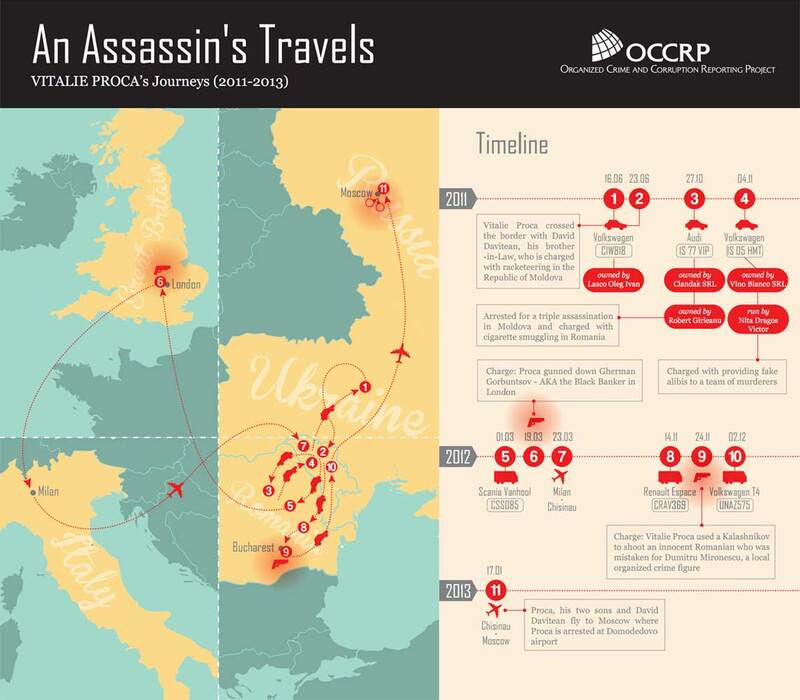 While the border logs establish connections between Proca and other alleged assassins for hire, the entries right before and after the London and Bucharest assassination attempts show a more cautious Proca using public transportation. Proca entered Romania from Moldova on the March 1, 2012 aboard a Scania tourist bus that crossed the border in the Oancea border point, in Galați county. Nineteen days later, on March 20, Proca shot Gorbunțov in London. Three days later Proca returned to Chișinău by airplane from Milan, Italy. The next time he crossed the Romanian border was on the 14th of November 2012 aboard a Renault Espace van. Passenger vans are regularly used by small travel companies between Moldova and Romania. 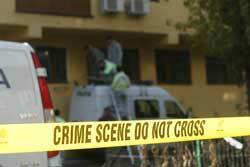 On the 26th of November, Proca allegedly pumped ten bullets into an innocent man who was mistaken for an underworld figure. A week later Proca returned to Moldova in a Volkswagen passenger van through the same border point at Sculeni where he exited Moldova. 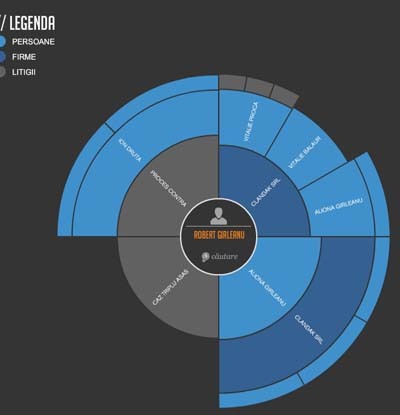 Other border logs point out to connections between Proca and Proca’s brother-in-law David Davitean, who is charged with racketeering in Moldova. 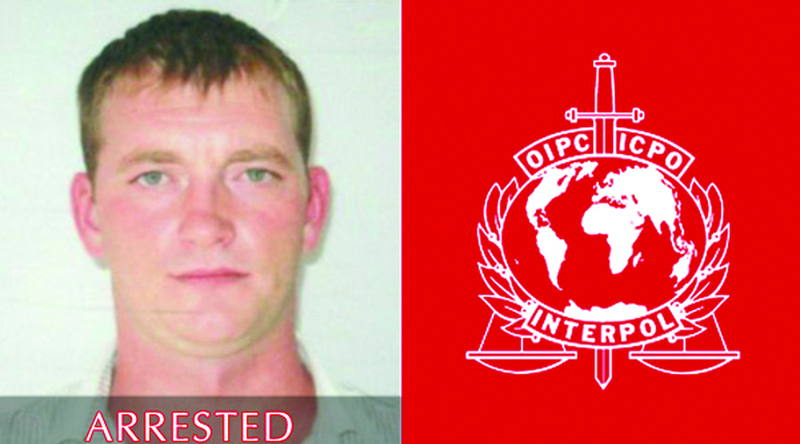 According to an indictment seen by OCCRP, David Davitean was involved in aggravated assault in November 2012 when he broke into a Chișinău apartment. Davitean beat up three men and robbed them off their money and mobile phones. He was also charged in 2004 with attempted murder when he shot a man in a Chișinău bar. Proca’s next trip outside of Moldova was, by plane, to Verona, the Italian city where Shakespeare based his “Romeo and Juliet”on December 22, 2012. However the next log entry showed Proca arriving at Chișinău’s airport on the 17th of January 2013 from Moscow. He was travelling with his 3-month-old son, Vitalii Proca, who was born one month before the Bucharest assassination attempt. Proca, however, turned right around and returned to Moscow three hours later with Vitalii, his other son Tigran and his brother-in-law Davitean. 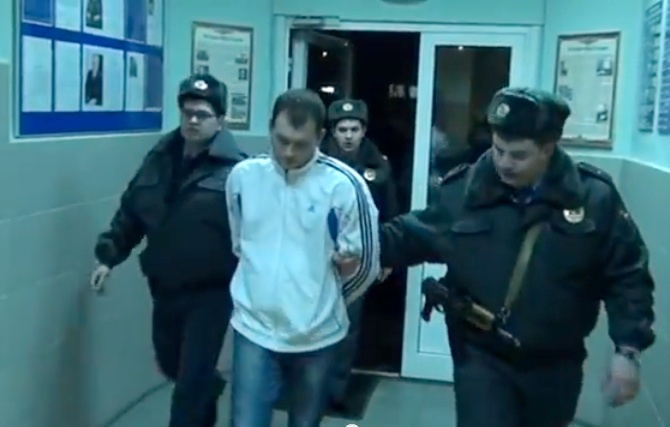 There he was arrested on arrival, handcuffed and taken into custody by the Russian police. Moldovan authorities told OCCRP that both Proca and Davitean used fake passports on occasion so that the border logs may not show all of their border crossings. Proca’s close relatives including his mother as well as his mother-in-law, Venerea Gasparean believe Proca is not guilty. Gasparean, the mother of Davitean, is a well-known Armenian-Moldovan singer. “Everything the authorities and media say are lies. Vitalie is not guilty but someone wants him as a scapegoat. He’s never been to London. He was in Italy visiting some relatives and he had no way of getting to London. It’s very easy for the authorities to check the dates in the passport.” She also says that Proca’s alleged involvement in the assassination attempt in Bucharest is also false. She explained that Proca often crossed the border to Romania because he intended to open up a business and move there together with his family. “It’s all made up. They say he received €20,000. Where is the money? He didn’t even have money to go to Moscow with his children. I gave him money.” said Gasparean. This is a joint investigative effort by The Organized Crime and Corruption Reporting Project and The Guardian.